-Desined according to Cessna-182 real plane,with cool appearance. -Rudder volume size adjustble,and you can do all kinds of difficult movements accurately,such as going forward, up/down, turn left/right, fine tuning, 360-degree rotation,spiral moxement,loops,etc. Q Where in the USA is this shipped from? can we buy its parts? The directions say to plug into a computer or cell phone to charge the battery, can you just use a usb wall plug? Can u fly two of these planes at the same time? Yes! I ordered two at once. both control flight controllers are set to each plane so one does not inter fear! Heck, I think One could order five and each would be on there own set frequency ! The Control distance is 200m. My son was very disappointed with this! The parts did not fit together well. It is an aerodynamic state where an aircraft is moving somewhat sideways as well as forward relative to the oncoming airflow or relative wind. In other words, for a conventional aircraft, the nose will be pointing in the opposite direction to the bank of the wing. Yes, the F949 is made of styrofoam as are 99.9% of the light aircraft RC market. Some manufacturers claim their product is made of Z-Foam, however, I have not seen any significant difference from standard styrofoam which has been around for decades. The F949 is a great beginner flyer. Can a buddy cord be used for learning with the controller? Yes a buddy cord be used for learning with the controller. What are the dimensions, and is it ready to fly are do you assemble it yourself? 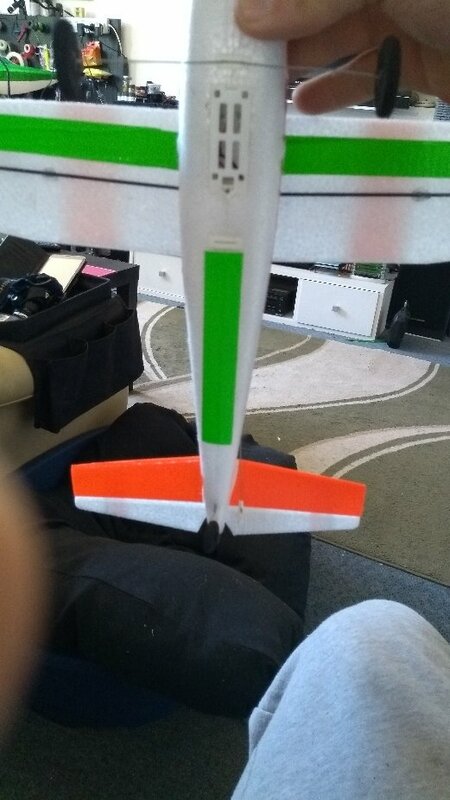 The wing spam is approximately 24” and you just have insert that landing gear into the slots and screw the wings. Very simple. I have experienced many cheap RC planes and almost gave up everything. I will ask anyone who gives negative criticism to this aircraft: What better? Before I understood it, I hit it 8 times in a row, no problem. The plane shook a bit and flew again. One aircraft costs three times more and runs for eight minutes. The plane flew for 20-25 minutes. It comes with an extra propeller (if it crashes) and 2 batteries. Some negative comments talk about it as a bubble. This is what is flying a lot. The wing is an EPP foam, so it won't break like other remote-controlled aircraft. I once flew it up, it was too high, I could barely see it, it went on! I have no complaints at all. very funny. Flying is very good. I bought this replacement Hobby King Mini J-3 Cub I bought, I will never fly very well. It was discovered that the engine gear had a curved tooth and did not allow the engine to accumulate enough. Speed ​​fly. I don't know if this is because of a previous crash, but about learning something flying or something. I bought WL Toys F949 because of the cheap price and some good reviews. This is one of the best ways if you are learning to fly. I first went out with this plane, after some accidents, I woke up, hoping I bought some extra batteries when I ordered the plane but didn't want to spend more money than I had to do until I See that I can fly, look at the plane, I can fly alone. Since I ordered 2 batteries, I am waiting for you. The flight of the plane is very good and stable, and I am very happy for a newcomer like me. 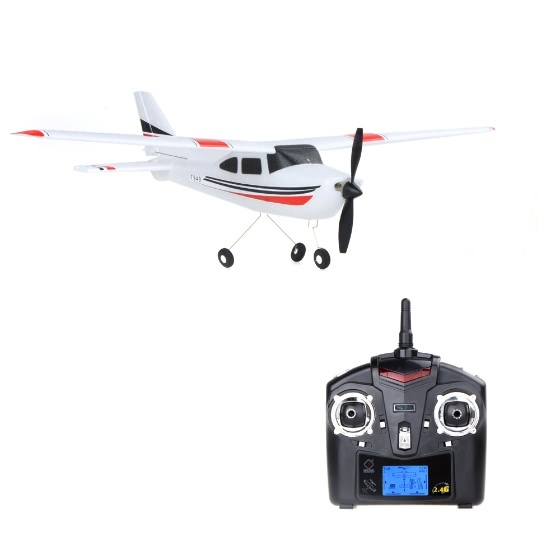 I recommend ordering some extra batteries when ordering this aircraft because I want to buy it after your first flight. When the battery is charging, the aircraft can easily fly for more than 20 minutes. Another advantage is that all parts of the aircraft are available online, so repair or replacement parts should be readily available. I will continue and only ask for a replacement engine when it is used up. I don't think I need anything else because the plane is very durable. After I crashed with this plane several times, you couldn't even see any damage. 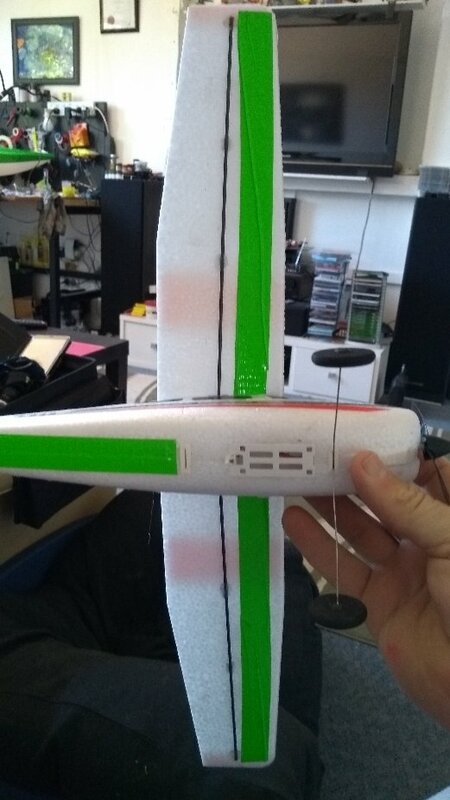 So if you are looking for a cheap entry-level RC plane for a beginner, I will definitely buy this, I did, I am very happy that I did it. Happy flight! I bought this for my boyfriend who took it out for the first time today. He is very satisfied, very happy and flying very well. He encountered a problem when he landed, but even if the landing was bad (about 6 times), there was no damage. He is very happy with this, but now he needs another battery to fly longer. He hopes to make good use of this to upgrade to more expensive products. He said that he is learning perfectly. He and I recommended using the steering wheel for the first time. Yes, it is made of Styrofoam, but it looks very powerful. Don't judge books by cover, but get extra batteries. This small plane made me have a good time, flying for a long time and flying easily. Have a good shock and must hold the front landing gear firmly. My son likes this drone, he is 9 years old, this is his second remote-controlled aircraft, suitable for beginners. Very fast and safe shipping. The Wltoys f949 is a very nice plane to enjoy this hobby. Personally I don't like the type of the radio, but the receiver support the AFHDS and that's why it was easy to bind with my i10 TX. 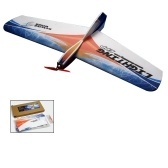 I have more balsa and foam planes too, but they are bigger than this little beauty. Now I have a perfect small plane to let it simply in my car's back until I work, and after I can stop on the way to home to make a little flying. Great item, Rate this seller AAA+++.Excellent shipping. Fast shipping, excellent product; would buy from again, Thank you! Soooo.... as a first time RC pilot, this little boy impressed me. It took me about 2 or 3 minutes to get the controls figured out (and a few rough landings) and to get it trimmed out with the included transmitter to be pretty easy to fly... I actually was really getting to enjoy it.... Easy to fly, and the rough landings at first only required a rag to wipe off a little dirt and one time I had to re-install the landing gear... but it really did good for the first little bit Then, one slight goof.... and I had a busted prop on it. Which is no big deal, they included an extra in the packaging, which made me feel better about my goof, as they must expect this to happen on a tiny trainer like this and were helping you get ahead of the game. So, I figured a 3 or 4 minute repair and I'd be back at it. (Extra props are available on Amazon for this plane as well). This is where I was let down. First, the instructions are pretty poor. This is a Chinese toy, and as such the instructions were written in Chinese and then translated to English, so the translation is really hard to get what they are trying to tell you. Also, no place in the instructions are any type of repair or maintenance instructions... so this prop switch was all on me to figure out. So I used "Youtube" and watched a few videos to help me get an idea of what I should be doing. 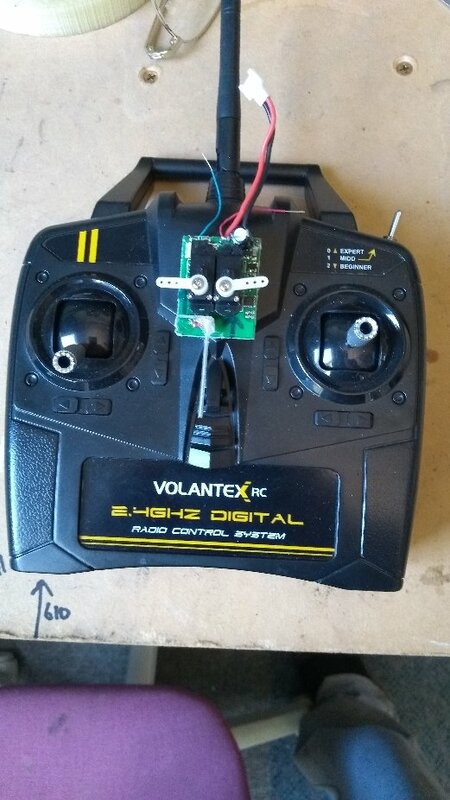 Again, this was my first RC plane, and I would like to move up in the level of plane, so even though this isn't a high dollar item, I figured I could give a repair a go, especially for a part that they included an extra for. Second let down- All the videos show the propeller easily pulling off the shaft to be replaced. This was not the case. I don't know if they glued this propeller on or what, but no matter how much I tried to gently encourage the prop off, it just was not moving. I tried all the options I could think of, and finally got to the point where I figured a little more "force" was needed to get this dislodged. And at that, the entire "spindle" that held the propeller and also had the gearing on the end of it to mesh up with the 3 motors pulled off. It was held in place by a small metal pin that immediately became loose and then slid back into the motor compartment. when the spindle came off... which means that I could not push the spindle back on, as the pin that held it in place just pushed back into the motor. Once the spindle was off, I did manage to get the broken prop off and the new one on, but I can't get the spindle back on to the metal pin. I have not given up yet and am still working on seeing if the pin will sit where it's supposed to if I can get back pressure on it and slide the spindle on, but due to the build of the plane, I'm not sure what I can sneak down behind the motor area to push against the back of the pin to get the spindle on. LUCKILY, I also bought the Canopy protection plan, which covers something like this. For this plane, under $50, it was only an extra $5 and you can actually add other items on to it as well, for under that amount... so if my repair fails, I am covered to at least get my money back out of it. If the repair had gone as planned, I would have given this 4 stars, as the actually initial problem of the broken prop was my issue.... however the way things went in the repair has me believing that there were some build issues present that caused my problem... so reduced the review. I plan on posting pics once I get the chance to add into this. UPDATE------ No pics, but I did get the prop fixed. Took some fancy odd ball work, and if you have the right tools it actually wouldn't have been as bad- I got a small nail inside the compartment behind the motors so I had back pressure as I pushed the gearing and prop back on to the shaft... once all the way on it was just a matter rotating the gear to mesh with the motors. Still... the prop change shouldn't have changed this much work. I did increase my stars from 2 to 3 as it seems the fix worked. The battery and propellers shown that buyers frequently bought together with this airplane are not the right size for this plane. I found out the hard way, now I've got to try to figure out how & where to get the right ones. I broke the prop the first time I flew it and nearly destroyed the motor trying to remove the prop. The instructions are terrible, wish now I'd bought a better plane. Great plane. As long as you crash in the grass it takes a licking and keeps on ticking. Super fun to fly. 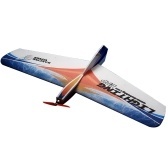 This is the best plane to get if you are starting out in the RC plane hobby. The high wing design of the Cessna makes flight more stable and easier to control. The wings also have a lot of dihedral (upward bend, V shape) which also makes flight more stable and easier to control. The 500 mah LiPo battery lasts an average of 20-25 minutes, which is unheard of for planes! The motor is powerful and the plane can go pretty fast for how small and light it is. Its lightness makes it less likely to be damaged in the beginner's inevitable crashes, and the foam is very sturdy and can handle lots of crashes and spills without so much as a scratch. The 3 channel remote that comes with it has throttle control on the left stick and rudder and rudder and elevator control on the right stick, which is much easier for a beginner to handle than the 4 channel remote with aileron controls added to it. The remote is capable of digital trim and has a range of ~200 meters. For $47, you aren't going to find a better deal for a starter RC plane than this plane from this seller. The plane was shipped to me (US) in less than a week.